Central Planning reports yet more options to customize gameplay, including one to four discs at once and a special ‘hard bounce / soft bounce’ switch. As always, level and score are saved across upgrades, and the fine fellows in Mechanicals have ensured that your pleasure can begin with the single touch of a button! Innovative obstacles redirect the discs during gameplay to challenge expectations at each level. For those eager to collect OpenFeint Achievements, ‘unlocked’ levels may be replayed at will. SteamPunk Hockey’s robotic intelligence has been adjusted to better protect its home goal territory against simultaneous discs, and appears to have ‘un-learned’ some unfortunate lessons as to which goal to score. A fine candidate for boarding school where there ever one to be seen. Your reviews and support are readily and gratefully accepted by Central Planning, and our fellow Futurists are planning yet more intriguing game features for you, the gentle player. 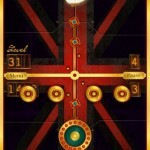 URGENT Message received from Old World outposts – SteamPunk Hockey HD invades top New World Charts!